PL2303 HXD GPIOs - .[ZooBaB]. I was hunting for many days for a USB dongle that would provide GPIO entries in the form of entries in /sys/class/gpio. I found the Oneping.com.tw PL2303 breakout board with the chip PL2303 HXD (or HX revD), which has nice 2.54mm pins for 4 GPIOs (GP0, GP1, GP2, GP3). According to the datasheet, there seems to be 4 auxiliary GPIOs (so 8 GPIOs in total), but there is no documentation on how to use them. Oneping produces 3 different versions of the board for different GPIO output voltages: 1.6V, 3.3V, 5V. I own the 3.3V version. Wang YanQing wrote a patch (local copy pl2303-gpio-sysfs.patch) to recent kernels (this is one is tested against 3.16, 4.1) in order to expose those GPIOs in /sys/class/gpio. 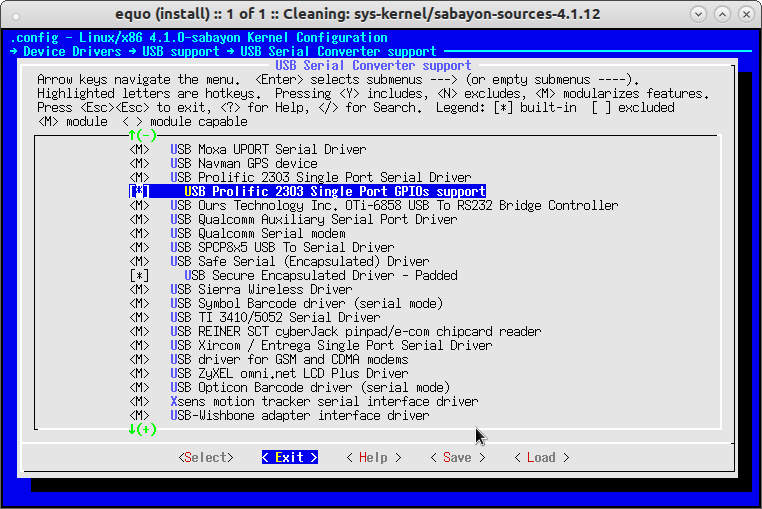 root@sabayonx86-64 /usr/src # equo install "sys-kernel/sabayon-sources-4.1.12"
drwxr-xr-x  6 root root 4.0K Feb 25 18:46 .
drwxr-xr-x 21 root root 4.0K Feb 25 18:42 ..
drwxr-xr-x  6 root root 4.0K Feb 25 18:48 . Hunk #1 succeeded at 519 (offset 3 lines). Hunk #2 succeeded at 32 with fuzz 2 (offset -102 lines). Hunk #5 succeeded at 246 (offset 3 lines). Hunk #6 succeeded at 478 (offset 3 lines). Hunk #7 succeeded at 507 (offset 3 lines). Hunk #8 succeeded at 521 (offset 3 lines). 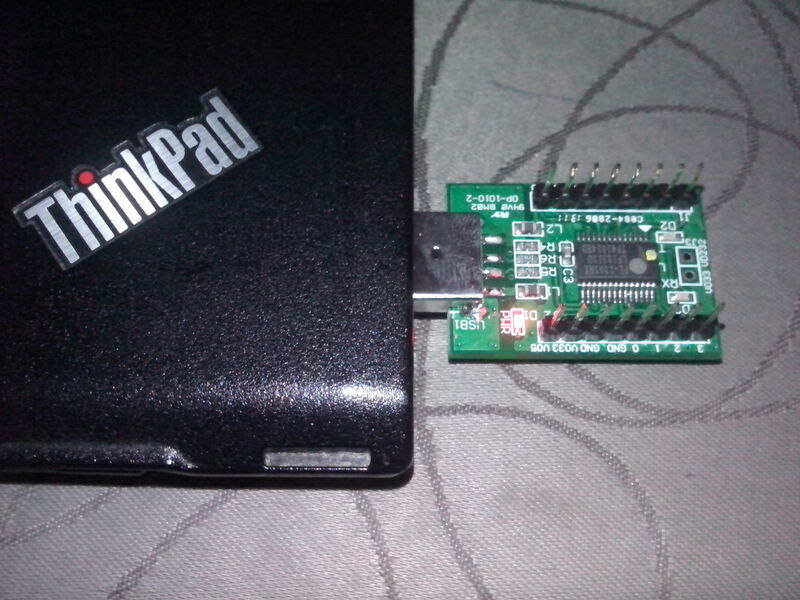 The go to "-> Device Drivers -> USB support -> USB Serial Converter support -> USB Prolific 2303 Single Port Serial Driver -> USB Prolific 2303 Single Port GPIOs support". +       bool "USB Prolific 2303 Single Port GPIOs support"
+         PL2303HXD and PL2303RA currently. Toggling the pins on the shell works, but I have to test the toggling speed with a C program. Which confirms that it is working as expected. I also tried with a chinese clone (small chip covered with some black paste), got the same error, could export the 2 GPIOs, but could not write to them. The android app PL2303GPIOActivity.apk provides an GUI to toggle the 4 GPIO pins and the 4 auxiliary pins (this is a feature NOT documented anywhere). The app only works on some tablet versions of Android. After fighting with different tablets which supports OTG, I decided to give Android-x86-4.4-r1 a shot on my Lenovo X200 laptop, and it works like a charm. The only problem is that the kernel does not have support for usbmon, so I will need to recompile the whole thing to be able the sniff the USB packets. Stay tuned! Cypress has also pushed a patch to support 12 GPIOs over USB with the CYUSBS234. A devboard CYUSBS232 is available at Mouser, including the standalone chip CY7C65213-28PVXI in SOP28 format. Sparkfun sells now a nice breakout board with this Cypress chip. Just discovered this patch posted in June on the LKML: https://lkml.org/lkml/2014/6/9/406 . It is not merged in mainline because kernel guys are nagging about it, so I am trying it now on the ftdi-gpios-sysfs page.